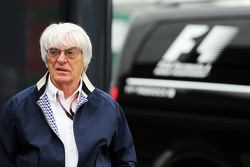 Formula 1 supremo Bernie Ecclestone expects Renault to decide this week on whether or not it takes over the Lotus team. Discussions have been ongoing for some time, and it is understood that Renault boss Carlos Ghosn will make the final call after reviewing the options. The situation is complicated by the fact that much of the team's debt represents loans from its main shareholder, the Genii Group. Sources suggest that one scenario is that Renault could enter as a new team, using the Enstone facility and staff, but not taking over the actual company that began life as Toleman in 1981, and subsequently became Benetton, Renault and Lotus. This would appear to gel with the fact that the FIA deadline for interest in a future F1 entry was extended to the end of this week – presumably to coincide with the timing of the Ghosn decision. Lotus meanwhile is under severe pressure to resolve its financial issues. In Hungary, Pirelli did not release its tyres until just 50 minutes before FP1 after a late payment issue was addressed. "We're gradually getting things sorted out," Ecclestone told Motorsport.com. "By this week we'll know which way we're going. "Hopefully then we'll know whether Renault are going to take them over, or what's going to happen." Asked if there was a plan B if Renault decided against it, he said: "Semi. I think we've got it more or less under control." Ecclestone also confirmed that a Renault takeover would not automatically trigger extra payments based on its past performance and historical record, but added that as a manufacturer there is potential to earn more based on future results than if the team remains in private hands. "They've got to do what everyone else is doing. They're buying a team, they're taking over a team. "If you took a team over you'd be entitled, except that they are a manufacturer so we are looking after them a bit differently. Renault would come off better than if a private person did it as they're a manufacturer."